When I was training for my first half marathon, on my rest days I was adamant about getting in at least 10,000 steps a day. Having a family, a job, kids, as well as kids sports activities, stretched my time so thin that I was having trouble meeting my daily step goal. One of my key focuses was to try to get in my daily steps before I went home from work which was at 5 pm. I tried getting in my daily steps in for a few days and it didn’t work. 6:00 AM: Wake up. Walk for as long as I can. If you can walk for an hour you will gain about 6,000 steps. 7:00 AM: Get ready for work. 7:30 AM: Continue getting ready for work then leave for work. 8:00 AM: Arrive at work and immediately go for a 10-minute walk. Walk to the furthest bathroom or water dispenser at your facility. If you walk for 10 minutes, you will gain another 1,000 steps. So that brings us to 7,000 steps. 8:30 AM: Start your daily work routine. Take another 10-minute break to get more water or go to the bathroom. If you need to talk to a co-worker walk over to their office. If you can walk for about 10 minutes, then you can gain another 1,000 steps. You should now be around 8,000 steps. You just need 2,000 more steps to meet your 10 by 10 goal. 9:00 AM: Continue your daily workload. Take another 10-minute break and grab a snack or something. May you purposely left something out in your car? Go retrieve and walk a couple laps in the parking lot. Do this for 10 more minutes and you can gain another 1,000 steps. Your total step count so far might already be close to 10,000 steps. 9:30 AM: Continue your daily workload. 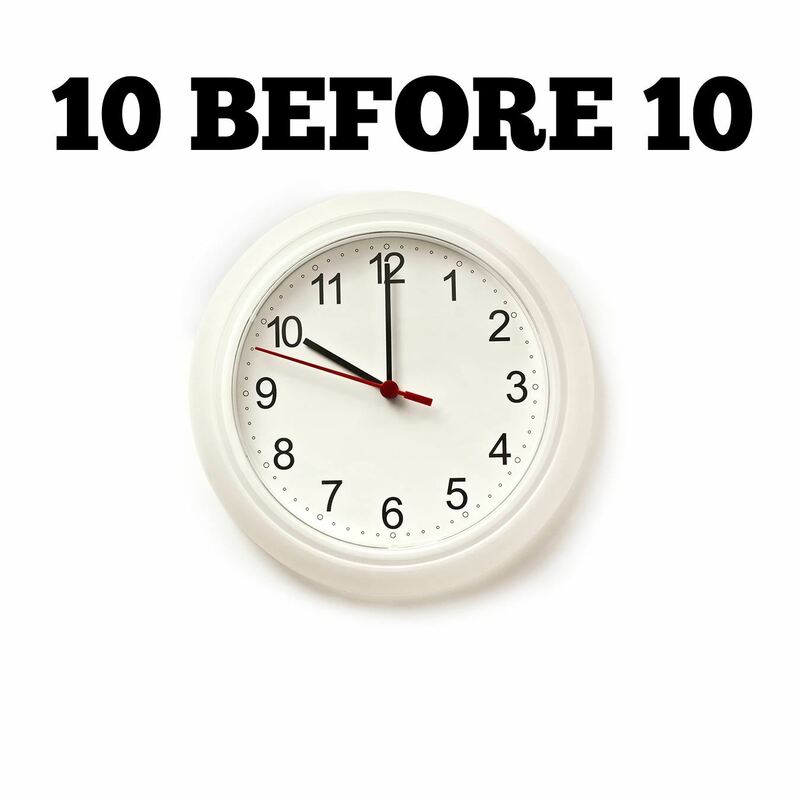 10:00 AM: If you haven’t hit 10,000 steps before 10 then, 10 minutes before 10 go get some coffee, a snack, some water, maybe pick up something at a co-worker’s desk. Congratulations: You should now be at about 10,000 steps! Social media and checking email should be kept to a minimum because while you are engaged in these tasks you are usually sitting idol. No longer stressed out about getting in 10,000 steps in a day. Freed up the rest of your day after tackling 10,000 steps. Even if nothing else was achieved the entire day, you accomplished your 10,000 step goal before 10 or at least before the close of business. Try 5,000 before 10 and then try to get the other 5,000 steps before you leave work by taking 5 additional 10-minute walk breaks. Try it for just one day to see if it works out for you. Go for a 10-minute walk to call a client or to make an important business calls. If you can’t get in any steps before you arrive at work, then make it a habit at work to go for a 10-minute walk every hour while at work. By doing this over the course of a workday (8 hours) then you should be able to gain between 7 and 8,000 steps. If you have an hour lunch break, spend 30 minutes eating and the other 30 minutes walking (2,000 steps). Scott Morton is the author of, Beginner’s Guide to Half Marathons: A Simple Step-By-Step Solution to Get You to the Finish Line in 12 Weeks! (Beginner To Finisher Book 4) which has become an Amazon international #1 bestseller. To sign up for a FREE half marathon training schedule, log sheet, and pace predictor click here.